Lick Library, a big supplier of guitar tuition DVDs, has just released a comprehensive series of Jimi Hendrix guitar tuition DVDs. Widely considered as one of the most creative guitarists in the history of rock music, Jimi Hendrix was one of the most important and influential musicians of his era. The mere mention of his name will start many guitarists finger picking. His raw talent and creativity defined some of the most revolutionary music of the 20th century, taking guitar playing to another level. For many though it was simply his ability to express raw emotion though music. 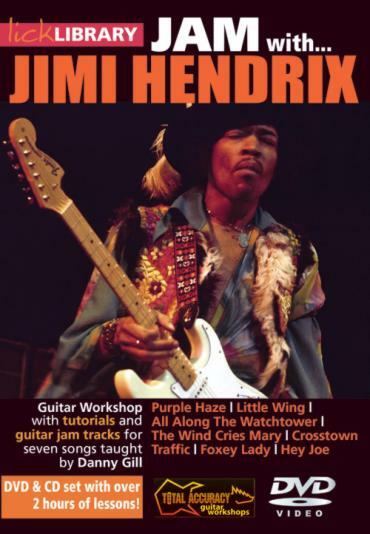 This new series of DVDs provides expert guitar tuition on some of Jimi Hendrix’s most often requested tracks such as Purple Haze, All Along the Watchtower, and Little Wing. With these DVDs you can put yourself in Jimi’s shoes, learn how to play his songs, solos, licks and riffs and see the techniques he used. Learn to Play Jim Hendrix is taught by Danny Gill, a former student of Joe Satriani. Volume 1 includes note for note guitar lessons to: Purple Haze, Little Wing, Voodoo Child, Hey Joe and The Wind Cries Mary. Volume 2 includes All Along the Watchtower, Foxy Lady, Redhouse, Fire and Stone Free. Danny breaks them down into small sections, lets you learn at your own pace and shows you how to put the smaller pieces together. Jam with Jimi Hendrix is also presented by Danny Gill. This DVD reveals loads of secrets including the 'Hendrix Chord' which he used in so many songs. You can see how the songs are played, hear how they should sound and then try it yourself with the backing tracks. The seven tracks included, give away lots of the master’s tricks and tips such as double stops, hammer-ons and those amazing Hendrix embellishments which make ordinary chords come to life. Also included is a CD of professionally recorded guitar jam tracks for each song allowing you to play along with a full session band. Tracks include Purple Haze, Little Wing, All Along the Watchtower, The Wind Cries Mary, Crosstown Traffic, Foxy Lady, Hey Joe. Quick Licks Slow Blues in the style of Jim Hendrix is again presented by Danny Gill. The DVD takes a look at over 30 classic slow blues licks in the style of Jimi Hendrix. Each solo is demonstrated and explained by breaking it into 'bite sized' easy to follow segments. Danny also clearly describes essential key scales such as blues, major and minor pentatonic, and mixolydian as well as chord progressions and arpeggios.